Alan Pardew will throw himself into local community projects as “penance” for the touchline behaviour that he admits shamed his two daughters. The Newcastle boss once again apologised for his verbal spat with Manuel Pellegrini – an unsavoury exchange which was captured by Sky TV’s cameras and led to criticism of Pardew’s conduct this week. The United boss has been subjected to criticism from former boss Graham Poll, but says his biggest concern was his family, who told him his language was “not appropriate”. He intends to make it up by helping out a housing association in Walker and also putting his hand in his pocket to aid a local boys’ club that is struggling. He explained: “I felt even though it was not words I would like to say again, I thought it was done in a dismissive way rather than an aggressive way and that may have been taken into account. I am not proud of the comment I made. “I am going to punish myself. I have got a couple of ideas I am going to do locally which will take up my time and money. Pardew admits that his biggest critics this week came from within his own family. “They both go to public school, I earn enough money for them to go to public school. They were very, very shocked. We don’t have a swear jar at home. I will just say my two daughters made it clear to me, daddy, not appropriate daddy,” he said. Despite the dent to his reputation, Pardew says that he will not change his demeanour on the touchline. Although he will not use the same language, he has pledged to keep “fighting” for his team. “I am the sort of manager that when I go on the touchline I am part of it, tactically, mentally, physically,” he said. “I want my team to win. I will be the same at West Ham. West Ham fans know me. They know what I am like. I think I am fair with referees and I am as honest with criticism as I am with praise. 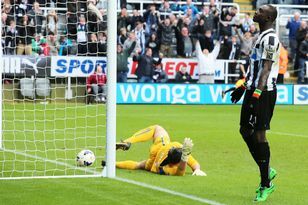 Pardew is not the only one who has been punished for last weekend – Mike Jones has also been stood down for disallowing Cheick Tiote’s excellent volley in the Manchester City clash. The Newcastle manager says he agrees that Jones should pay a penalty. “We have to put it to one side. I don’t think we are ever going to forget it because we have a big sense of injustice, but I do think the referees have made the right call with him not working this weekend. “He got it wrong and he has paid a price for that. I’ve got no problem with that, I think it’s one game they miss and that says it all and that’s right. Meanwhile, Pardew has defended the decision to allow Jonas Gutierrez to leave for Norwich on loan. He insists there is nothing sinister about giving the winger the green light to join the Canaries. He said: “He has gone on loan, he has not left. He was not playing first-team football. He wanted to play and I thought we had good cover for him to go out and play and that is what I have decided to do. I wish him well at Norwich. Chris knows him well and will get the best out out of him. “He did nothing wrong here. He has been a great player for us but wasn’t playing. He is a senior player and I think he was desperate to play.